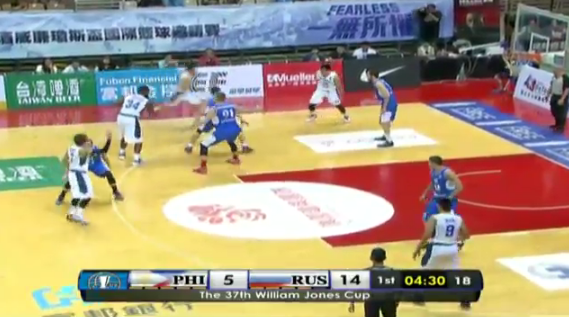 Gilas Pilipinas vs Russia opens Day 4 of William Jones Cup 2015 in Taiwan. The Philippines' Gilas Pilipinas 3.0 team is now playing vs Russia in Taipei, Taiwan, with the former hoping to recover from their 12-point loss to South Korea last night. Just like Iran, the Russian team is another strong team at the 2015 Jones Cup, having won their past 3 games and still undefeated. Now it's all up to the Gilas Pilipinas to end Russia's undefeated streak. Based on the live streaming video by Sports5, PH was behind by 9 points, 5 minutes left in the 1st Quarter. But after the quarter, Russia's lead was down to just 3. 23-20. In the 2nd Quarter: it has become a tight game. Gilas leads by 1 point, 32-31, 4:32 left. At halftime, Gilas leading by 3. 43-40. 3rd quarter scores were 61-50, still in the Philippine team's favor. And the game ended at 85-71, a huge win by the Gilas.